Sometimes, you may need to cut your music file and make a ringtone for your phone; slice off the annoying intros and outros of your beloved song for playing on the party; or join the trimmed audio clips to form a new audio for some special purposes. For whatever situations, what you need is a useful audio cutter and joiner tool. Cutting and merging audio files online is quite simple and fast. You don’t have to install any software or program on your computer. Thus, we here collect top 4 effective audio cutter and joiner online tools for you to split and merge audios with a few clicks only. Aconvert is an easy-to-use web-based audio cutter and joiner tool that enables you to cut and merge audios online with ease. 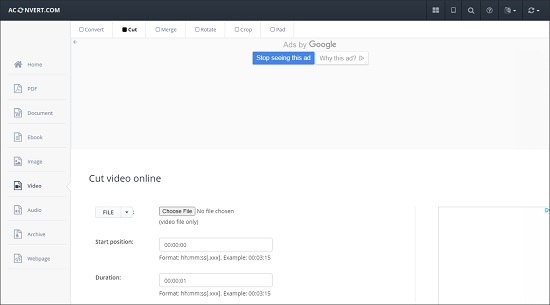 You can add your audio file from your computer’s local folder or directly enter an online file URL address into the box. 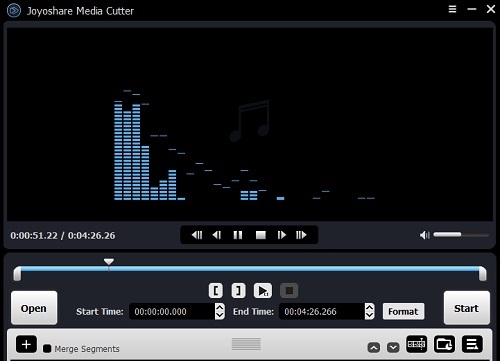 The online audio cutter and merger supports various audio file formats including MP3, WAV, WMA, AAC, OGG, AU, FLAC, AIFF, M4A, OPUS, RA or MKA. And it is capable of cutting and joining MP3, WAV, OGG, AAC, M4A file, with the maximum file size of 200MB. When you use Aconvert to merge music file, keep in mind that the audio files you added must have the same bit rate and format. The new file will be combined to the latest audio clip created. This app offers both Audio Cutter and Audio Joiner for users to easily trim and combine songs, create ringtones for iPhone, extract audio from video, etc in the browser. You can also add fade-in and fade-out feature to make your song more smoothly. Like Aconvert, Online MP3 Cutter also allows you to open your target file from the computer, Google Drive, Dropbox, or just paste online audio URL directly. It supports hundreds of different file formats and more audio file formats are going to be listed. And you can also join as many audio tracks as you desire. This is another straightforward song cutter and joiner online tool you can try. With Free Online Editor, you can cut an audio file in a couple of clicks. Just upload or drag an MP3 or WAV format file, enter the start time and end time in seconds and then download the cropped file after it’s finished. 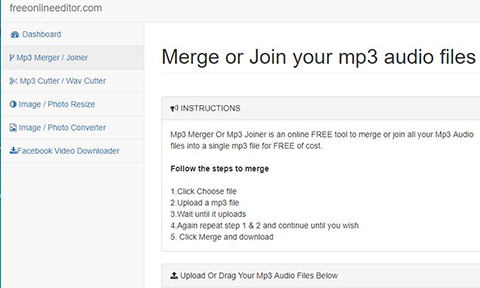 Joining an MP3 file is also very easy, and you can get a clear guide on its site. To protect your privacy, all uploaded MP3 or WAV files will be deleted automatically within several days. Bear Audio Editor is a versatile online audio cutter joiner and editor as well. 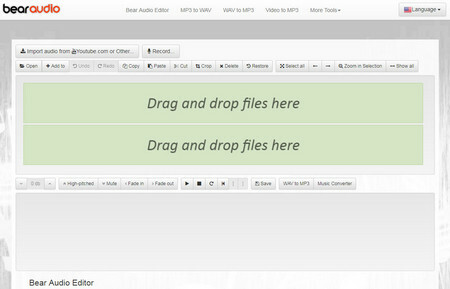 It is based on HTML 5, so you don’t have to upload any audio file you want to cut or merge to the server. With it, you can cut, crop, delete, copy and paste audio files, join any audio, song or ringtone together. Besides, you can also adjust the volume of the music file, or even mute it, apply fade in and fade out to your song, etc. The program only supports three input formats, namely, MP3, WAV, OGG, yet you can save your edited audio in several formats such as MP3, WAV, M4R, AAC, WMA and OGG, etc. Online audio cutter and joiner tool is easy to access and operate, but it also has its disadvantages as described above. If the online apps disappoint you, maybe you can try a desktop audio cutter and merger such as Joyoshare Media Cutter. Joyoshare Media Cutter for Windows (or Joyoshare Media Cutter for Mac) is an all-in-one smart efficient audio cutter joiner and editor program that enables you to split any media file into pieces, cut out unnecessary part of an audio, make a ringtone for mobile phone, combine several audio clips together, edit the audio in the way you like, and more. With the built-in audio editor, you can apply some special sound effects to your audio, remove noise from the audio, add a piece of background light music to the song, etc. The software supports tons of input and output audio formats like MP3, WMA, AAC, AC3, FLAC, AIFF, AU, MKA, APE, OGG, WAV, M4A, M4R, etc. And you can also export your edited audio file onto any of common popular portable devices, even the latest Apple iPhone X, Samsung Galaxy S8, etc.